In Hanoi, which is derived from the Towers of Hanoi you have three stacks with a variable number of stones. Your goal is to get all stones from the left stack to the right stack. However, you may only put a smaller stone onto a bigger one, which makes the taks quite difficult. 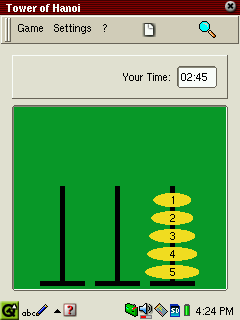 This is an implementation of the well known Hanoi game and therefore gains its advantages from the challenging game principle of the Towers of Hanoi. However, the implementation is quite simple and the graphics is not very impressive. If you have found out the strategy how to solve the game there is also no challenge left. This is a good programming exercise but not a super exciting game.